I read this article and found it very interesting, thought it might be something for you. The article is called Muslims Have Highest Fertility Rate, Lack Access To Healthcare and is located at https://archive.indiaspend.com/indias-great-challenge-health-sanitation/muslims-have-highest-fertility-rate-lack-access-to-healthcare-36353. Mumbai: Hindus have India’s highest infant mortality rate with 41.6 deaths per 1,000 live births and the third highest fertility rate–the average number of children a woman would have by the end of her childbearing years–of 2.13, the latest health data show. Hindus also have the third-lowest access to healthcare facilities, with only 79.3% women receiving antenatal care (including at least one tetanus toxoid injection and iron folic acid tablets or syrup taken for 100 or more days) visits from skilled professionals, lower than Sikhs, Christians, Buddhist and Jains, national family health survey data show. Muslims have India’s highest fertility rate, 2.61 per woman, and the second lowest access to antenatal care provided by skilled professionals (77%). A “child survival hypothesis” states that if child mortality is reduced, fertility reduction follows, with the net effect of lower growth of population, according to this 1990 study by Finnish Medical Society. Adding a maternity clinic to a village decreases the odds of infant mortality by almost 15% in comparison to the risk before the clinic was added, evidence from a 1995 study in Indonesia show. An additional doctor reduces the odds by about 1.7%. Though the fertility rate for Hindus is lower than the national average, it is high compared to communities like Christians, Jains, Sikhs and Buddhists. While the national average is 2.2 children per woman, Muslims have the highest fertility rate (2.6) followed by others (Jews, Parsis and tribes that do not identify themselves as Hindus like Khasi, Jaintia & Garo in the North east) (2.5) and Hindus (2.1). Meanwhile, Christians (1.9), Sikhs (1.5), Jains (1.2) and Buddhists (1.7) have lower fertility rates. 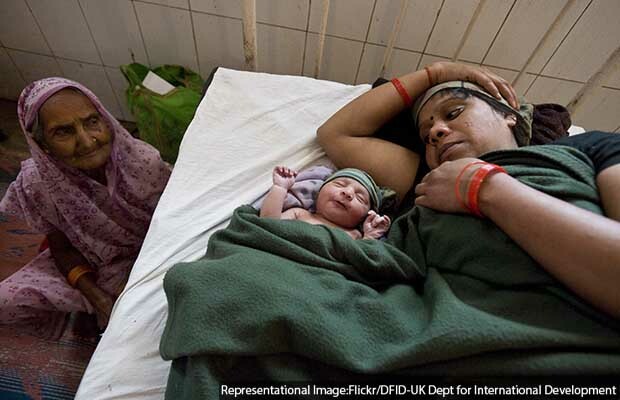 As many as 79% of women delivered babies at a health facility; the lowest proportion was among “other religious communities”–which include Jews, Parsis and tribes that do not identify themselves as Hindus like Khasi, Jaintia & Garo in the North east–(51%) followed by Muslims (69.2%). The national average for receiving antenatal care from skilled providers is 79.3%, while it is the lowest for “other religious communities” (68.5%), followed by Muslims (77%). The lack of access to healthcare facilities also inhibits the usage of modern methods of family planning. For example, the national average for the usage of any modern method of contraception among women is 47.8% while the lowest is among “other religious communities” (36.5%) followed by Muslims (37.9%). Access to sanitation is another factor that is known yo have an impact on reducing child mortality rates. “We found that Muslim neighbourhood are less likely to have piped waters, and less likely to have other state services than Hindu neighbourhoods,” Dean Spears of the Research Institute for Compassionate Economics, told IndiaSpend in an interview on August 13,2017. Indirect factors that impact fertility rate includes higher education of women to employment status among women, research show. Women from “other smaller religious groups” and Muslims have the highest percentage of women with no schooling at 34.4% and 31.4%, respectively. The two communities also have the lowest percentage of women who have completed schooling of more than 12 years at 10.9% and 14.8%, respectively. Note: Others includes Jews, Parsis and tribes that do not identify themselves as Hindus, such as Khasi, Jaintia & Garo in the North east. Only 73% Muslim women participate in decision-making pertaining to one’s own health while the all-India average is 74.5%. Muslim women in rural and urban areas had the lowest labour force participation rate at 15.9% and 10.9%, respectively, while the national average was 25.3% and 15.5%, respectively.